This manufacturing agreement is for use by any business, for any product. Use for engineered product, clothes, furniture or anything else. The key point is that you are not instructing the manufacturer to finalise design work or add value but simply to make the product. It is an umbrella version suitable for either a single instruction, or for multiple or continuing orders. 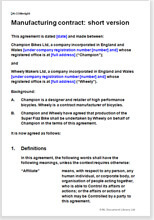 This agreement covers a deal in simple terms you can edit yourself. You know what you want and how to specify it. You need a local manufacturer to make it up for you. This may be a sub contract or maybe you do not have the required facilities. The product could be anything. What it is and what you want is to be set out in your specification.